“The main purpose of the launch is to confirm the reliability of rockets of the same class. The warheads successfully reached their target – the Kura testing range in Kamchatka. 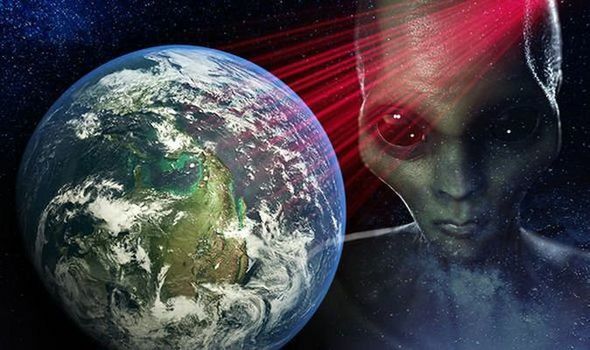 All aims of the test were achieved,” said a statement from Russia’s Defense Ministry. RS-24 Intercontinental Ballistic Missile (ICBM),heading to a launching Silo,Plesetsk Cosmodrome. 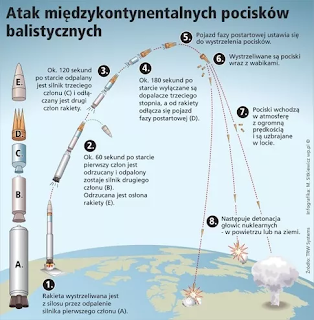 The RS-24 Yars, which is equipped with three to six warheads, is capable of hitting simultaneous different targets up to 12,000km away. The older version of the missile system was first tested a decade ago, and has been in use by Russia’s Strategic Nuclear Forces for the past seven years. The RS-24 Yars solid-fuel ballistic missile can carry multiple independently targetable nuclear warheads, and is designed to evade missile defense systems up to a range of 7,500 miles. The RS-24 Yars was introduced into service in July 2010. It is an upgraded version of the Topol-M Ballistic Missile that can be fired both from a mobile launcher like submarines and silo. In the course of its development, the experience of the military operation of fifth generation's mobile ground missile systems was taken into account. 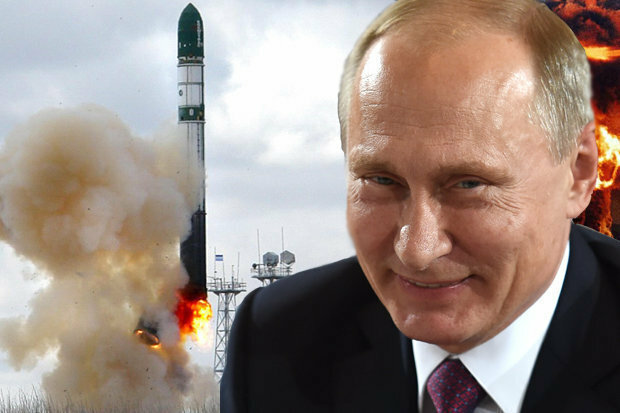 According to the Russian Defense Ministry, RS-24 Yars has established itself as a reliable weapon during its tests and operation, and therefore it was decided to re-equip the Russian Strategic Missile Forces with them. At the beginning of 2014, by different estimates, Russia had about 50 RS-24 Yars intercontinental ballistic missile deployed. 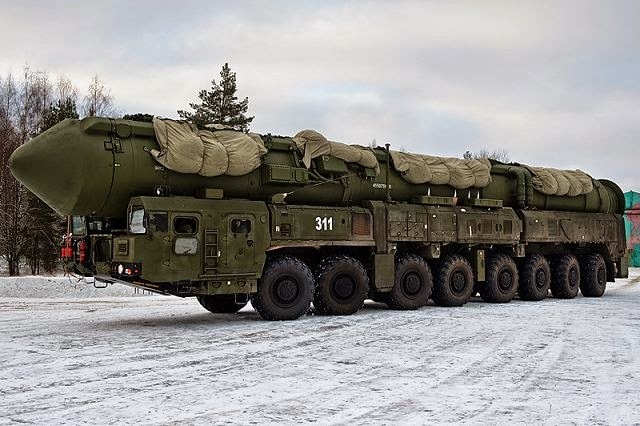 According to the Strategic Missile Forces commander Col. Gen. Sergei Karakayev, the Russian military will receive another new versions of RS-24 Yars intercontinental ballistic missile systems by year 2020. Russia's Strategic Missile Forces is expected to be equipped with 108 RS-24 missile defense systems entirely in future, according to the Russian Defense Ministry. The ministry earlier said that RS-24 Yars and Topol-M ballistic missiles would be the mainstays of the ground-based component of Russia's nuclear triad and would account for no less than 80 percent of the SMF's arsenal. Launch Weight: 49,600 kg; Payload: Three MIRV warheads, 1,200 kg; Warhead: Nuclear, 150-200 kT; Propulsion: Three-stage solid propellant Range: 10,500 km; Status: Operational; In Service: 2010. 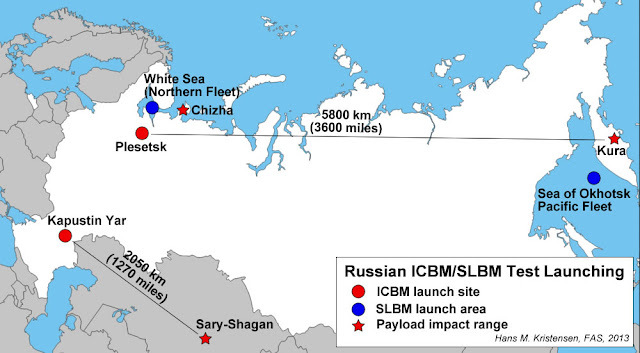 The solid-fuel rocket that house this new ICBM is an upgraded version of the Topol-M missile, and can be launched both from the ground and from a vehicle. At the beginning of September, the Russian Ministry of Defense announced extensive drills for 11 strategic regiments across 20 regions. 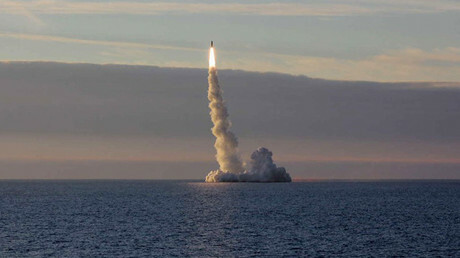 Russia tested its submarine-based Bulava ICBM in June, successfully targeting the same facility as in the latest test, located near the Pacific coast in Kura. A test of its RS-28 Sarmat super-heavy thermonuclear missile could be held in October, TASS reported on Monday, citing a military source. Designated SS-X-30 Satan 2 by NATO, it is expected to enter full deployment in few years. The new ICBM Rs-24 Yars can defy any Missile Defence system. Russia is a powerful country and pioneer of much weapon technology. With Putin being a firm believer of a strong defense force, so Russia spends huge amount of money on its security improvement. The Kremlin is well equipped and has many missiles ever on earth. The SR-24 Yars is one of most complicated ballistic missiles deployed with Russia with a speed of more than 7000m per second. No doubt Russia is serious with it’s security. Russia is considered a dominating state and rumors of Russian interference in U.S elections proves it. It's no doubt that current weapon deal between India and Russia will pave way for India towards becoming a global superpower. While most leading nuclear powers conduct scheduled tests of their strategic arsenals, recent. Russia, China, and the US have attracted extra attention in the wake of North Korea’s ballistic missile and underground nuclear tests.The strategic Borey-class nuclear submarine,Yuri Dolgoruky submarine, has successfully fired the Bulava intercontinental ballistic missile (ICBM) from a designated area in the Barents Sea to the Kura Missile Test Range in Kamchatka,” the MoD said in a statement.“The launch was made from an underwater position in accordance with the combat training plan.” “According to the confirmed data from mission control, the ICBM units completed the full flight program and successfully hit the targets in the range.” The Bulava missile for restance, which has a range of 9,300 kilometers (about 5,770 miles), must have travelled at least 4,600 km across almost the whole Asian part of Russia to reach its target. The Yuri Dolgoruky submarine, launched in 2008, is a fourth-generation Borey-class nuclear submarine serving with the Russian Northern Fleet. The Borey-class subs, which can carry up to 16 intercontinental sea-based Bulava missiles, are planned to be the basis for Russia’s strategic naval nuclear forces in the future. In addition to the Yuri Dolgoruky, the Russian Navy has two more such subs, with another five in development. By 2020, the Russian navy aims to have at least eight armed Borey-class submarines in active service.